Korean Air has officially opened reservations for the inaugural flight on its soon-to-be delivered B747-8, which the carrier will deploy onto its Seoul Incheon–London Heathrow route. Regular jumbo jet services are scheduled to commence from August 2, with the aircraft initially serving the aforementioned route three-times weekly. From September 1, the B747-8 will completely replace the incumbent B777-300ER and serve London Heathrow on a daily basis. Flight KE907 departs Incheon at 1300 and arrives in London at 1725. The return service sees flight KE908 take off from Heathrow was 1935, before touching back down in Seoul at 1425 the following day. The configuration for Korean Air’s B747-8 has been revealed. The jumbo jet will offer six seats in first, 48 in business (prestige class), and 314 in economy. In comparison to other competitors that use the B747-8, Korean Air’s premium seat configuration gives a positive first impression. Lufthansa for example offers eight seats in first class (two rows in a 1-1 arrangement, while the third row cramps four seats together), while Air China has a total of 12 seats (1-2-1). As Korean Air only has a total of six first class seats available, they are arranged in a 1-1 configuration with no middle row at all. 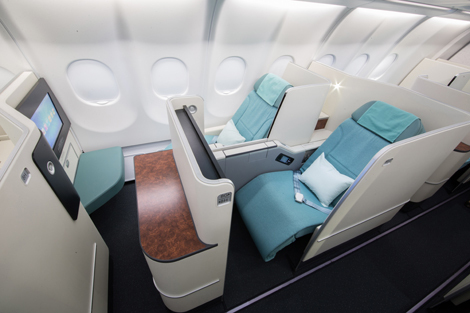 Korean Air has also designated the entire upper deck of the B747-8 for business class, and offers 22 seats here, with the remaining 26 situated on the main deck. The upper deck seats are arranged in a 2-2 layout, while those on the main deck are 2-2-2. In comparison, Lufthansa also offers a 2-2 seating arrangement in the upper deck of its B747-8. However, the German carrier fits 10 more business class seats here. Likewise, Air China (2-2) has a total of 30 seats in its upper deck. All three carriers also offer the same 3-4-3 layout in economy. However, due to the lower number of premium seats offered by Korean Air, the airline is therefore able to increase the number of seats in coach. With a total of 314 seats in economy, this is significantly higher than the 208 offered by Lufthansa, and the 233 by Air China.